How do you in good conscience write a negative review of a book written by a son about his dad? I know I sure don't want to be that jerk. But I think it only fair that prospective buyers be forewarned about what they are purchasing . Based on the title of John Q: The Life and Times of Jim Lange, I assumed that I was purchasing a biography of the Daily Oklahoman editorial cartoonist. In fairness, when I ordered the book on Amazon, there was a 'Look Inside' feature that I didn't bother with. Who needs to see what the inside of a biography looks like? Well, if I had taken the time, I would have seen that the book consists of short paragraphs on each alternating page, and a photo or cartoon on each facing page. Some of these short paragraphs (some are just a single sentence) comment in some way on the photo or the cartoon, or tell some tidbit about Lange. There is no biography here, just reminiscences plus some accolades written by Oklahoma notables. If the book had been called an admiring son's memorial or a scrapbook, that would be much closer to the mark. 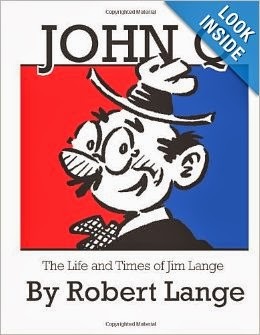 To say the book tells the "life and times" of Lange is nonsense. I also think the price is on the high side. A bunch of blurry black and white photos and a very small selection of cartoons (I count about twenty-five), and so little text that I could literally read the whole book while standing in a supermarket checkout line -- $16 seems out of line. I commend Robert for wanting to memorialize his dad, but I think this book is the sort of thing to be shared with relatives and personal friends. It is not really a commercial product that would appeal to cartoon fans or those who fondly remember his work in the Oklahoman.